The AVL hardware installed in a vehicle figures out the location of that vehicle with help of satellites, gathers data from various accessories and sensors and transmits the data through a cellular or satellite network to Wialon data center. This data can be interpreted to monitor in the Wialon web interface the whereabouts and other parameters of a vehicle in real time. I haven’t found my device in the list of supported hardware in Wialon. What should I do? If you’re in contact with the manufacturer and you have an opportunity to request the device communication protocol, this will speed up the integration process a lot. In case you don’t have information mentioned above, don’t worry – we will contact the manufacturer ourselves and try to get whatever is required for integration. The integration of LoraWan, Sigfox and other similar devices is the same as for any GSM hardware. If the device is not integrated yet, kindly contact us at hw@gurtam.com. I have found an interesting device at Gurtam.com. How can I buy it? At Gurtam we do not sell any hardware devices. We’re the software developer only. Nevertheless we’re trying to inform our customers about various hardware compatible with Wialon platform. Therefore to get the device you’re interested in, please contact the manufacturer or your local supplier. You option is Wiatag application – our proprietary software tracker. The application serves for basic tracking and efficient mobile workforce management. Wiatag is absolutely free to download and install on iOS/Android devices. I’ve designed my own GPS device but I don’t know which communication protocol to implement. We recommend you to use Wialon IPS protocol. Wialon IPS communication protocol was developed by Gurtam for personal and vehicle GPS/GLONASS trackers, which send data to satellite monitoring system server over TCP. Wialon IPS protocol is freely distributed under GNU FDL and can be used by manufacturers of GPS and GLONASS equipment as main protocol for data transmission between GPS/GLONASS trackers and communication server of satellite monitoring system. Which tracker works best with Wialon? Our goal is to support full trackers functionality in Wialon. We remain hardware agnostic company and do not distinguish any manufacturer leaving the choice to our customers. When choosing hardware you may refer to Gurtam rating of manufacturers or decide on any other device even if it is not integrated with Wialon yet. I want to use some sensors with my tracker. Should they also be integrated with Wialon? In most cases there is no need to integrate additional hardware with the platform since they work in conjunction with a GPS tracker. 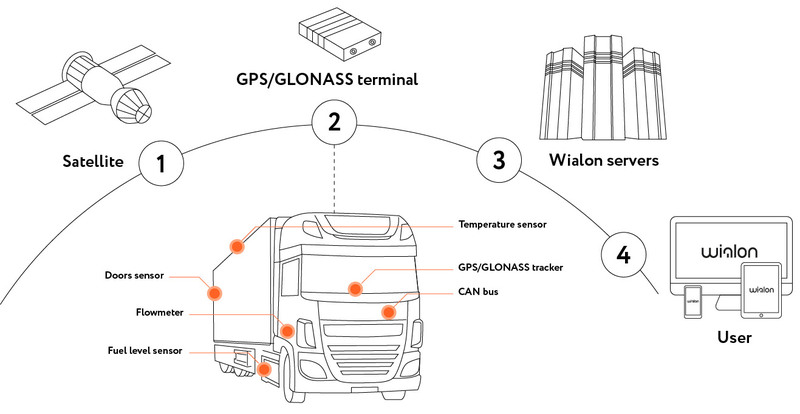 Therefore if the tracker is integrated with Wialon, you can connect various sensors to it. In case when a sensor has its own GPS module or works through transparent channel, integration might be needed and we will list it as a separate device type in Wialon. I don’t know my unit ID. What should I do? To check device unit ID, please use id.wialon.net service. Point your device to IP 193.193.165.167, specify device port (you may check your device port here). When the device connects to the server, there will appear its unique ID in the table of id.wialon.net service. Save this unique ID in unit properties. Then redirect the GPS tracker to send data to Wialon. How can I set up a tracker? First, please learn the device user manual provided by the manufacturer or supplier. If you still have difficulties with device configuration, email us at hw@gurtam.com and we’ll do our best to assist you. Which time zone should I set for my tracker? Though it is common to set up local time zone on GPS devices, it is not recommended, as Wialon works with data in UTC+0h time zone only. This is a mandatory requirement for correct data display in the system. So please reset time zone to UTC+0h in your device. Whereas, local time zone should be set in your Wialon account. Yet there is an exception from the rule – GPS watch. In this case you should set local time zone in the device. When integrating such device type we allow for specifying local time zone in unit properties, after that Wialon will automatically adjust it to UTC+0h. Seems like I set everything correctly, but the device doesn’t show online. What’s wrong? First of all, make sure the device sees satellites. Also, the reason may be in negative SIM-card balance. Check your APN, IP and port settings as well as unique unit ID in unit properties in your Wialon account. Sometimes a device needs another 5 minutes to come online. If after that the tracker still doesn’t show online in Wialon, please contact us at hw@gurtam.com and we will try to assist you. Wialon doesn’t store raw data from units. Why? Raw data storage requires huge drive space and is not of practical value for users. What is LBS and how it works in Wialon? GSM cell based location is a technology commonly used to determine unit position. We call it Location-based service (LBS) where a unit location is fixed by cellular towers’ coordinates. For data transmission GSM module is to be registered at a network provider cell base station, which in its turn transmits Cell ID and other parameters like lac, mnc, mcc. Some GPS tracker models can send Cell ID in the messages to the server. In case a unit doesn’t send GPS coordinates to the server, Wialon system picks up the base station Cell ID and searches the coordinates in our own database. LBS service could be helpful in places with poor or no GPS signal, in cases when precise location is not necessary or where hardware without GPS module is used. My device sends only LBS messages. What’s wrong with it? There could be a few reasons for it: your tracker doesn’t see satellites, GPS module or GPS antenna is not working. My tracker does not send LBS data. Why? Your device has incorrect settings. To get LBS data, a device needs to transmit at least 4 parameters: mcc, mnc, lac, cell ID. Please check your device settings and make sure your device can transmit those parameters. You haven’t activated Message validity filtration. In Advanced tab of unit properties tick the checkbox ‘Message validity filtration’, then activate ‘Allow positioning by cellular base stations’ function. Can I use dash cameras and MDVRs with Wialon? Yes, you can! Wialon supports video hardware which allows for real-time video tracking as well as getting video files from the devices memory by command or event. The full list of supported video hardware is available here. I have a video device which is not in the list of supported. How can I integrate it with Wialon? Video monitoring in terms of GPS tracking is quite a young industry therefore not all video devices are suitable for working with GPS tracking platforms. To integrate a video device with Wialon, it should meet some requirements from our side. If you want to have your device supported in the system, kindly email us at hw@gurtam.com and we will analyze the possibility of integration.